Trolley tours, chuck wagon dinner & show, nightly rodeo, golf course, rafting trips, trail rides & more; let us help you plan your visit, experience the true western heritage of Cody while staying at our full service RV park. Need adult size toliets, very low and small. People were friendly and the office/store was very nice; location was in Cody is great and within walking distance of the Buffalo Bill Museum; BUT the campsite was very narrow; we could not extend our awning without getting into our neighbors site. The campground road is very tight, making it difficult to back a trailer into the assigned site, car/trucks were parked too close for maneuvering a RV. Had no resv, close to, and over the Forth of July, they fitted me in, very nice people, enjoyed the stay, site was very crowded,wi-fi didn't work, but the campground was full, no spaces left, happy to have a spot. Would stay here again, close to everything in town, rodeo grounds, and Cody Museum. Stayed at this campground for over a week. Very friendly and informative staff. The campground is kept clean, quiet and centrally located to everything you need, from restaurants, rodeo, Walmart, and auto parts stores. Not too far from Yellowstone's East gate (about 50 miles). Nice place to stay for a late in the season get away. Really enjoyed the area. Great location close to Buffalo Bill Museum & convenient off main road but noise is NOT a problem as nice and quiet. The sites were 'snug' but had nice grass. Only in office to sign in and very friendly staff w/great information. Did not use/visit the store or other stuff in the campground. We had reservations and stayed 3 days. Utilities & WiFi were excellent. We would stay here again if in the area. Very friendly and helpful staff. Terrific gift store. Very busy tourist area with grass around parking and some trees. Able to walk to town and museum. Fenced pet area very small and droppings were not picked up. Many people with dogs walking around the trailers. Clean older restrooms. We stayed twice at different times, but will probably try another more dog friendly place next time. 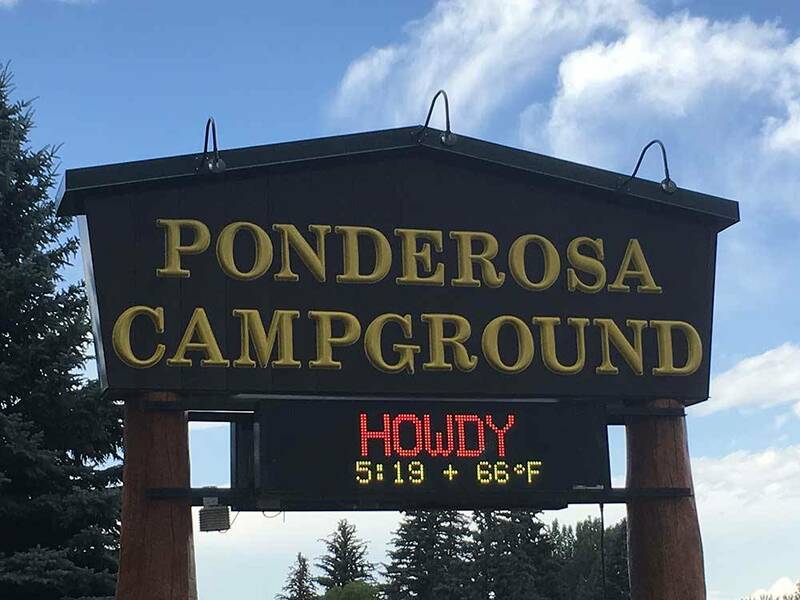 Our group of nine campers had a fabulous time at the Ponderosa. It's central location made getting to attractions easy. The staff went out of their way to make us feel welcome, and we loved having our group all in one bunch. The Grizzley Den worked well for our pot luck dinner and other get-togethers. We'll all visit again when in Cody. We'd recommend this campground to anyone looking for good-sized sites with trees, nice facilities, and friendly hosts. Spaces were close together. Wifi signal would not work. People were very nice. Laundry was clean. Bathroom clean but, stalls were too small and, I'm not that big. Campground location close to downtown was good. This place is right in Cody and is very busy, almost always near full. Sites are small and close together. Constant RV's arriving and leaving. Cody is a tourist town but not in a bad way. What I mean is things are not overpriced and they don't gouge you like say Jackson, Wy. I didn't see any sites that were big enough for trailers, motorcycle or car. I had to unhook and cram my MC trailer on my site. It's convenient, you can walk to a lot of Cody. the park was nice and conveniently located to downtown Cody. But they are not renting camping spaces, its more like parking spots. They are so close together you cant let out the awning, not enough room. The bathrooms were nice, clean but needs updating.